**Note: Here at DormCo, we're not sure what it is about this nifty flashlight, but California's wacky regulations prohibit sale of it to residents of California. Imagine this- you're sitting at your dorm desk or on your dorm bed and you're studying for your exam that is the next day. All of a sudden, there is a power outage in the dorms. You don't want to use your smartphone's flashlight app as tempting as it can be. Yes, it is convenient to have a flashlight app but those apps drain your cell phone battery. When your cell phone battery is drained, you can't be in contact with your friends and family. Normally, you could just charge your smartphone immediately when it runs out of battery but that isn't going to happen in a power outage. Save your smartphone battery and keep a few extra dorm flashlights handy such as our 6" Rib Gripped Flashlight! Our 6" Rib Gripped Flashlight is more compact and easier to carry than your smartphone would be in case of power outage. This dorm essential flashlight has a tie cord on the end so you can easily hang it up on a peg for dorm room storage or wrap it around your wrist so it doesn't fall when you're using it. There is also a rubberized handle so you can have a secure grip on the dorm flashlight when you are using it. This college supply is compact and can also be easily stored in your dorm desk or college night stand. Or to be ultimately prepared, you can keep one dorm essential flashlight in each spot! 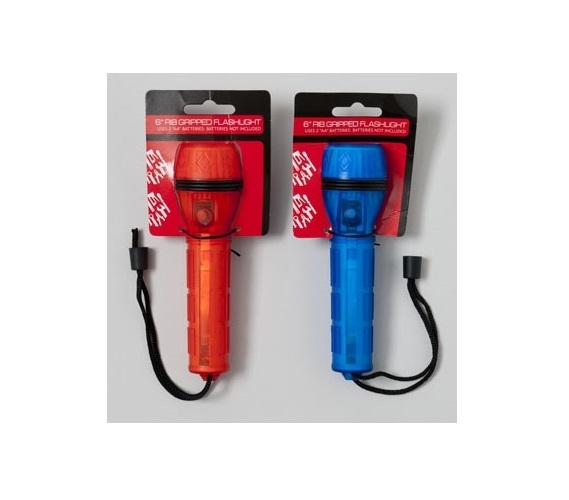 Don't go to college without a flashlight or two- power outages do happen and you want to be prepared in case they do!